WHEN YOU CAN’T FIND THE WORDS………#COYBIG! Coleman celebrates the win over Italy. Today is D-Day for Seamus Coleman and the rest of the Irish soccer team. Having seen off the Italians, Martin O’Neill’s team have to do it all again against France to advance to the quarter-finals of Euro 2016. In just a few hours time, 2pm to be exact, Donegal will come to a virtual standstill as we seek revenge on Le Bleu. Nobody needs to be told how Thierry Henry man-‘handled’ Ireland out of the 2010 World Cup. And seven years later, revenge could well be a dish served cold to our hosts in Lyon. 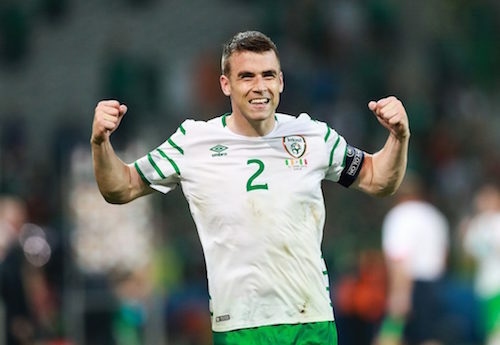 Seamus Coleman proudly led his team to victory against the Italians on Wednesday and he could well be chosen again by O’Neill to be captain again today. The Killybegs man will be a national hero if Ireland put one over on the French come 3.45pm today. And the prize for the winner? A quarter final against the winners of England and Iceland. As if James McClean needs any kind of incentive!